Once she wakes from her long slumber (sometimes up to 36 hours) and has her Tim’s, Chloe is ready to work as hard and as long as needed. She often spends her spare time doing exactly what she does for her day job: feral cat Trap-Neuter-Release programs (also known as TNRs), and low cost spay & neuter clinics. She has a love (read: obsession) with The Big Land (Labrador) and travels there once or twice a year to do remote spay/ neuter clinics. Along with the land of Labrador, she loves their token breed: the Indigenous Labrador Husky. Chloe enjoys hiking in the woods with her Border Collie/Jack Russel cross Clefford (so-named for his cleft palate), or relaxing with a cold one listening to Led Zeppelin – not coincidentally her cat’s name. She shares her home with her room mate and their two dogs, seven cats, multiple foster kittens, four gerbils, foster hamster, and a partridge in a pear tree! Her biggest interest in veterinary medicine is behaviour. 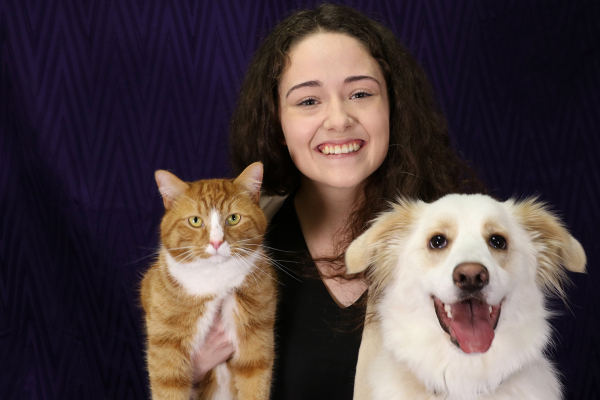 Chloe moved here from Nova Scotia after graduating from Dalhousie’s Faculty of Agriculture as a Registered Veterinary Technician.